A - Even though monster truck are becoming the new thing I still don't like them. L - Monster trucks are becoming popular many people are talking about what they do and why they are so cool even though they are becoming so cool i still don't like them myself. I have never seen a monster truck show but, I really want to. My friend Emmy has and she said it was really cool. I think that if monster trucks became even bigger the car industry will start selling monster trucks. I would want that to happen. I want to see monster mutt rottweiler in live action, and that's not normal for me because I don't like monster truck shows. I mean trying to do some crazy stunts like jumping over cars in a 12 foot high truck, and I am afraid of height's so I would never do anything like that. I knew won thing about monster trucks it was about grave digger but I had no idea about "Zombie.'' 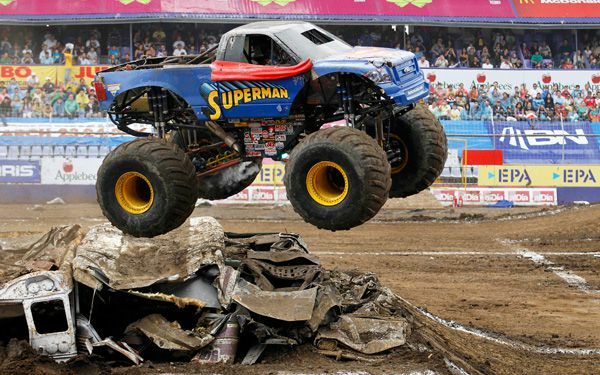 Also the picture is a SUPERMAN monster truck it is awesome. American entertainer has been sweeping the globe for generations, and the newest iteration is Monster Trucking. Monster Trucking is a "sport" where people drove large, loud trucks over jumps and crush old cars. The tournament "Monster Jam", started in 2004, has spread to different countries around the world. Monster Jam in Moscow attracted over 15,000 people, and monster jam is planning to go to Asia and South America. I have known "Monster Trucking" since I was little, but I never really thought it would catch on as much as it is. I really don't see the attraction of a bunch of oversized trucks smashing things under their tires. This article was awesome because it has some really cool facts. And that there is a picture of a SUPERMAN monster truck. Also I never new that there were 1500 people at a monster truck rally. So this is why I like this article. I thought the atricl was really amazing. I never knew that the '' Zombie'' was really frighting. I also learned that Kenneth Fled was in charge of Fled Entertainment. I also can not belive that in spring 2014 that 15,000 fans flocked to the show in Moscow. Also I can not belive that the sport started and it is still very popular. Also, about 55,000 people packed one stadium in Sydney, Australia, in October. This story is one to remember for me. The things I like is everything! the concept is amazing,the main idea of a company of monster truckers is some thing to remember, and the thought of every thing about this story. The the thought of 15,000 fans is amazing and detailed. But these monster trucks are going to cause pollution, and that is the only down side to this story.